Okay, today I'm going to post more favorite nails. I'm hoping to get this blog out into the world soon, so I might as well make it good to get people interested, right? The nails I'm posting today were inspired by another nail blogger, Emerald Sparkled. My love for other nail blogs, especially hers, inspired me to create my own! A while back, I saw some nails on Emerald Sparkled that I loved so much, I knew I had to do similar ones immediately! She totally turned me on to doing sets of mismatched nails. So here are my Emerald Sparkled inspired nails. I had these on for 8 days straight! I couldn't bear to remove them until they started chipping. This was my first time using a rhinestone on my nails. The way I like to apply rhinestones is with a small drop of Seche Vite in the desired area, then I apply the rhinestone with a toothpick. Let it set and follow with a full coat of Seche Vite! I was worried about it coming off really quickly, but I made sure to be extra careful of my thumb for around an hour after applying it, to give the Seche Vite time to really set. Now I wear them all the time and I've never lost one! Stamping done with Sally Hansen Xtreme Wear - White On! 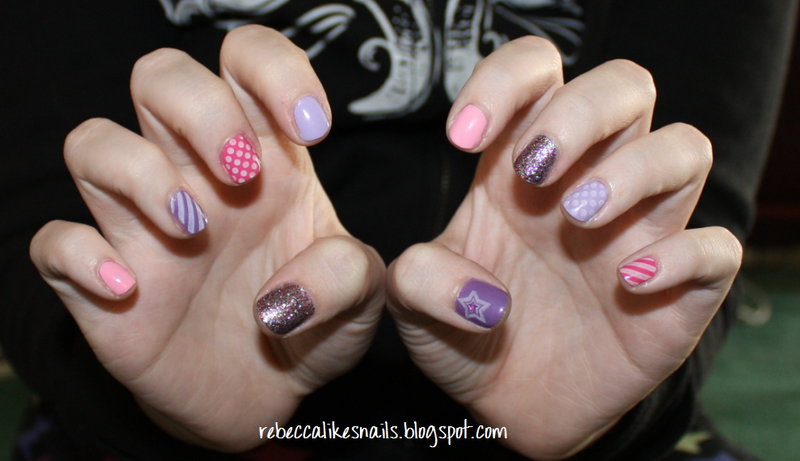 One coat of Mad as a Hatter, one of Rockstar Pink, and then another MAAH. I like this combo better than both on their own! If anyone is looking for a cheaper alternative to OPI's famous glitter polishes, Rockstar Pink is basically the exact same thing, but will only run you $2! 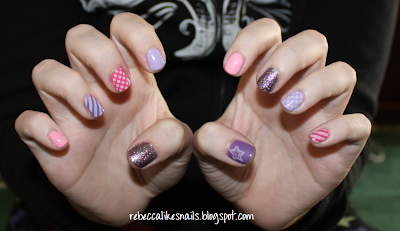 I hope you enjoyed my blogger-inspired nails as much as I did! OK, I think I'm re-inspired by this combo. What an awesome start! This looks way better than the manicure I did! Might copy this one =DDDD Adding you to my blogroll! I'm a new nail blogger too with only 4 followers! 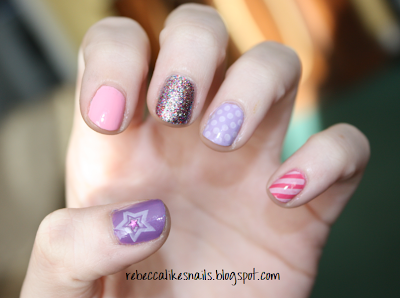 I loved this mani on Trincess' blog and it looks great on you too!! :) I love the "skittled" look. i'm a big fan too as you can tell! All your creations are amazing!! !